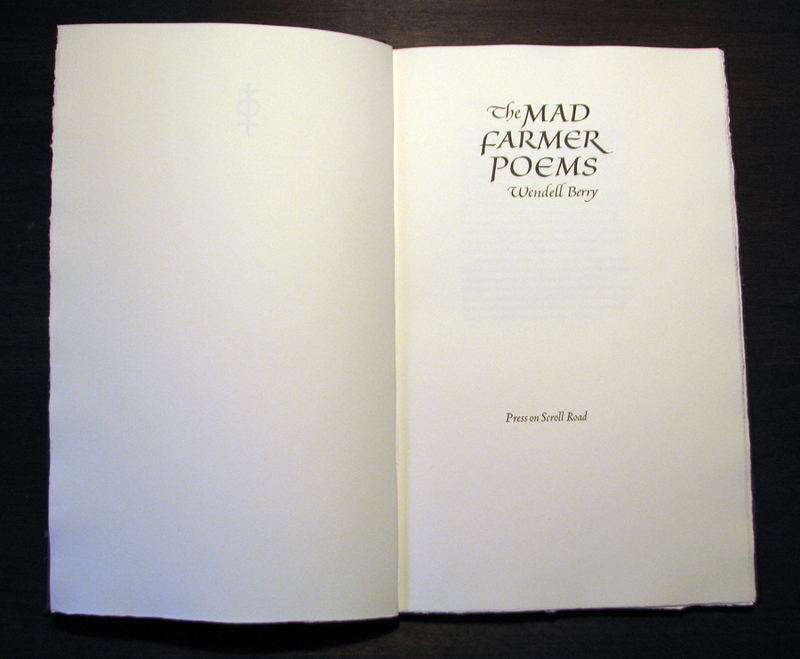 With contents chosen by Mr Berry, this book forms the definitive collection of his Mad Farmer family of poems. It includes a Foreword by Ed McClanahan, an Introduction by James Baker Hall, an Afterword by William Kloefkorn, and Engravings by Abigail Rorer. The text was printed from handset Cloister Lightface type, with title page lettering by Jerry Kelly, on handmade Twinrocker paper in an iron handpress. The sheets were bound by Priscilla Spitler at Hands on Bookbinding in quarter leather with papers marbled by Pamela Smith covering the boards. The book’s 48 pages measure 13.25" x 8.25". Sixty copies were made and signed by the author, and forty-six of these are offered for sale at $400.00 each. Out of Print.